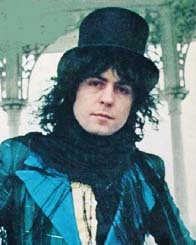 Richard Bevan, interview with Simon Napier-Bell, 19 April 2006: "Well, Marc Bolan never came out but he was completely bisexual. I slept with Marc. But he also liked girls. Privately he was never discreet about it, or careful. Looking androgynous and pretty might have said many things to people but the band Sweet were also pretty and lovely, but there was no one gay there."